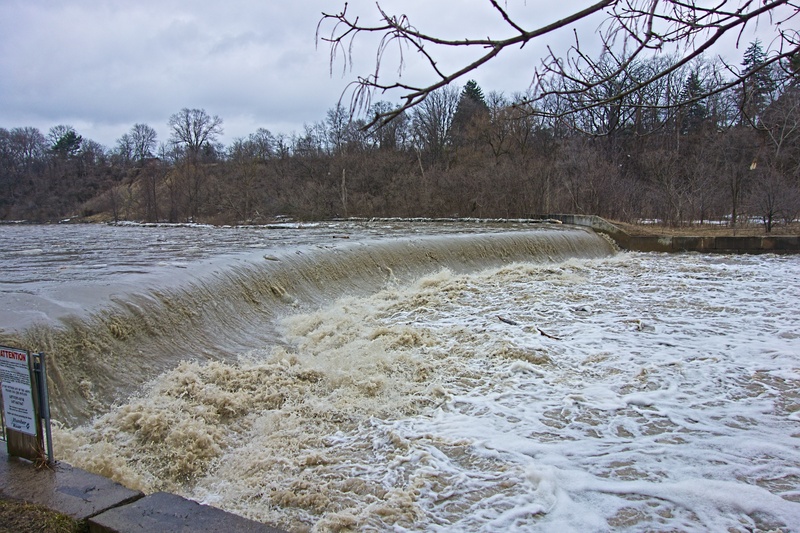 Flood waters are peaking and the Humber is sending billions of litres along with much flotsam and jetsam to Lake Ontario. Today’s photographs don’t do the event justice so here is a short movie together with some views of the raging torrent. Let’s start with some wildlife – these ducks (in the centre of the image) are conserving energy by resting in a quiet eddy away from the maelstrom. Ducks find refuge in calm waters. The amount of lumber going downriver is quite remarkable. Huge amounts of lumber are being transported – a log is just about to go over the weir. 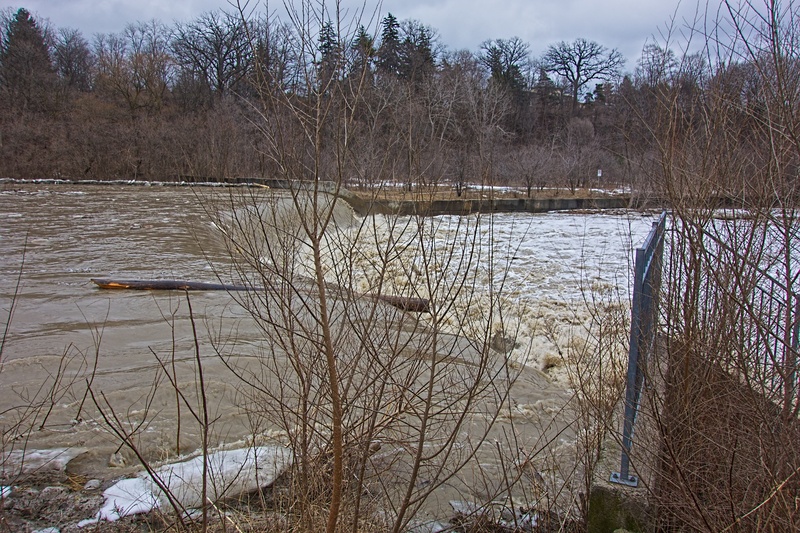 Standing close to the weir is quite the sensory experience with the thundering of the water (now much closer to bystanders) punctuated by the thumping of logs and ice blocks. It’s a very intense experience to stand close to the water. The twin carbuncles bear witness as chunks of ice and other debris are carried over the weir. In a few days, water levels will be back to normal but for now, the power of nature is a reminder of how puny we are. 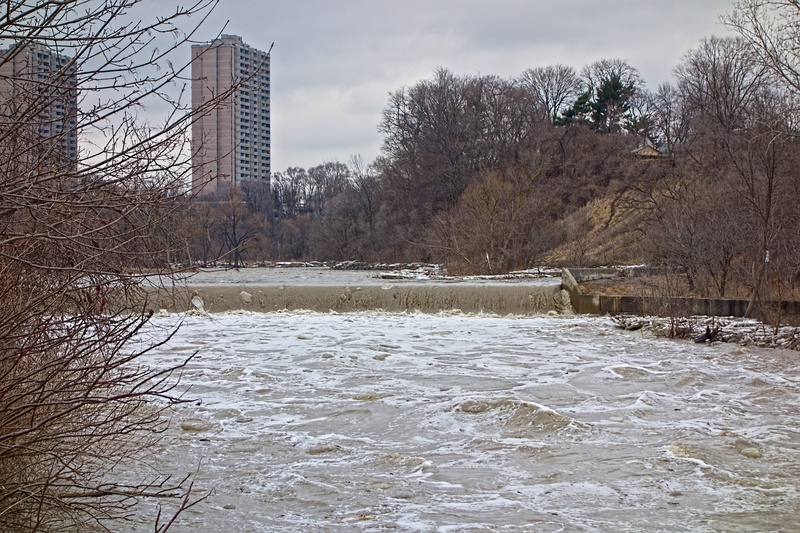 This entry was posted in Humber River, Ice, Park view, Photography and tagged flooding, Humber River, ice, logs, photography, water on 2013/03/12 by Roy Murray. There’s something sad yet majestic about a dead tree. To look at the living organism that once was evokes sadness. Trees along this stretch of the Humber are constantly being damaged by ice stripping away their bark. I liked the way light from the snow is reflecting onto the branches. 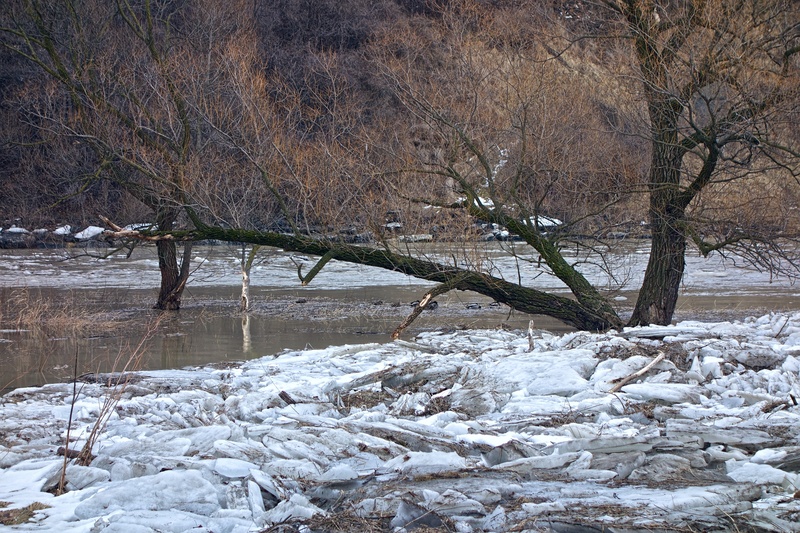 These trees are stark reminders of the power of ice along low-lying stretches of the Humber. River ice comes in a huge number of forms. This large pile-up of ice is crowned by a beautiful clear chunk which caught my eye. 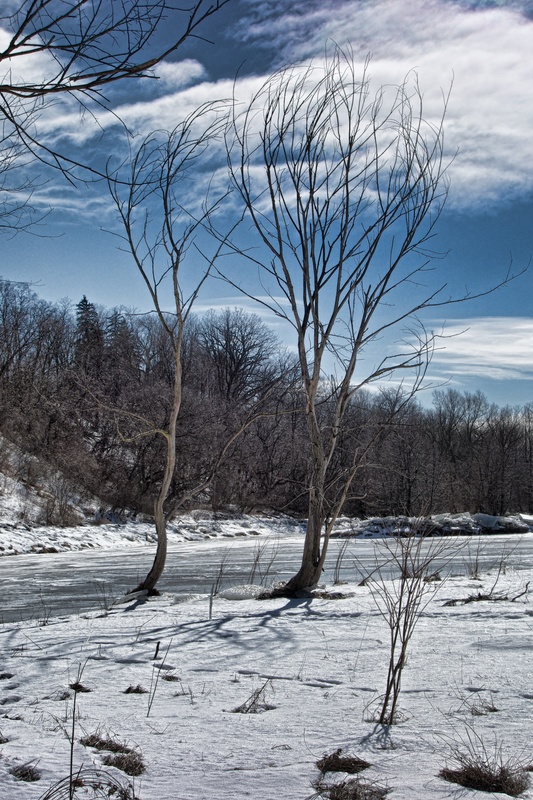 This entry was posted in Humber River, Ice, Photography and tagged ice, photography, trees on 2013/02/21 by Roy Murray. Looking south towards the apartments at Scarlett and Eglinton. 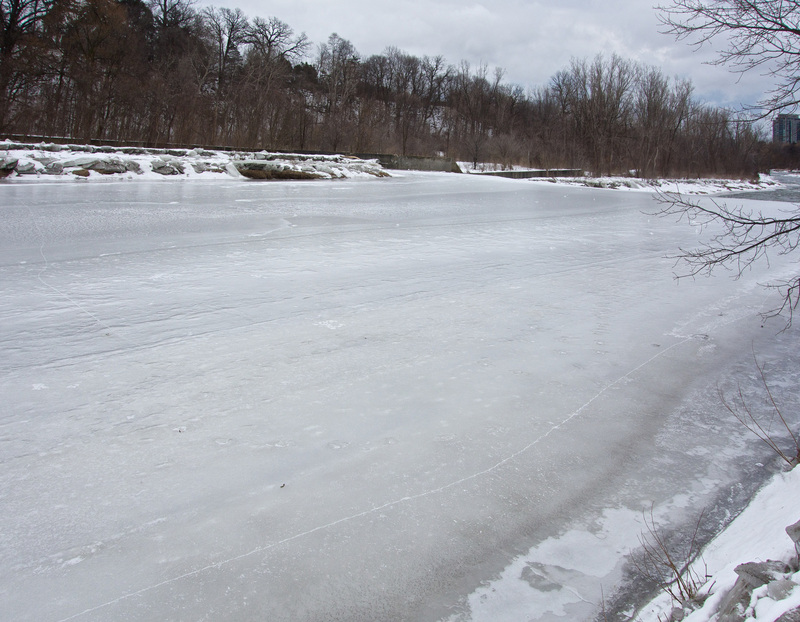 The cold continues and the Humber River ice is thickening. At this part of the river, water never freezes with a smooth surface – it’s just lumps of ice that have floated downstream and frozen together at this point. As winter progresses, the thickening process continues, snow and sometimes rain will be added. 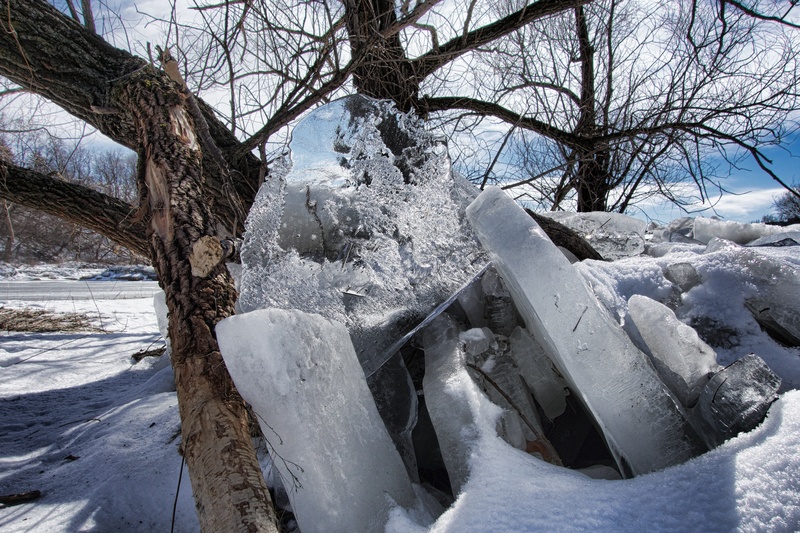 During a thaw, water flow increases and the ice forms a dam. Eventually, the ice breaks up and floats ashore in huge thick chunks (which I have never managed to witness).The trees along the bank bear the scars of previous years’ breakups. 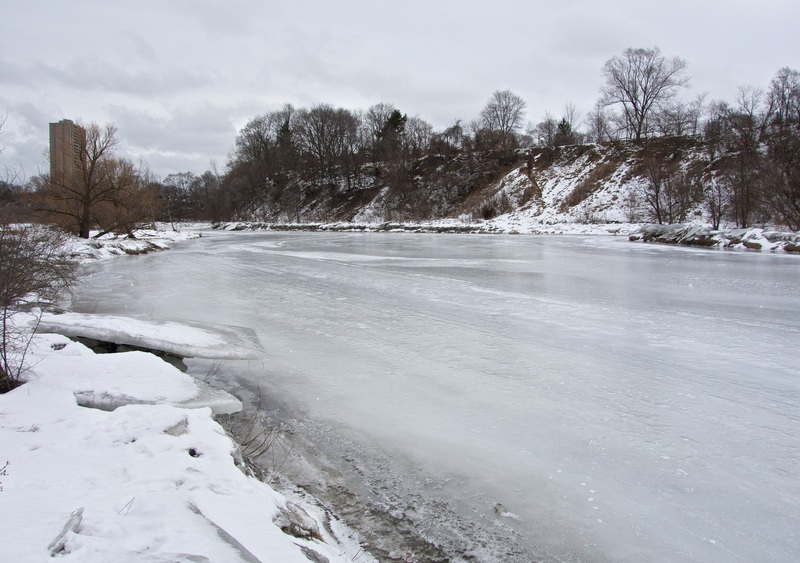 This entry was posted in Humber River and tagged frozen, Humber River, ice on 2013/01/02 by Roy Murray.